One feature we’ve done on this update is the ability to display several places of interests in a single map. This would help visitors of the site to view the locations of lists of places that we published on the site. 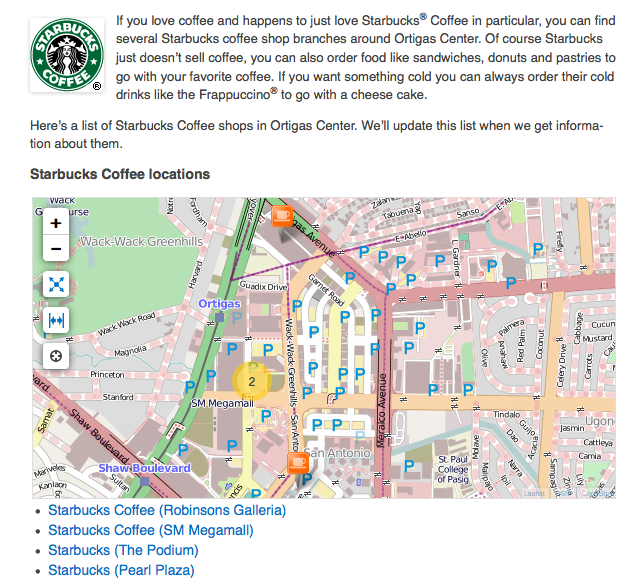 An example is the a featured article about a list of Starbucks coffee shops that you will find in Ortigas which now includes a map of the list of places. Soon, we’ll be featuring more of these lists as sub indexes on the site to allow you to easily find places. And more than that — to be able to search for places in Ortigas Center and plot those places in the directory on the map.